We've all dreaded it, waking up Monday morning after a nice weekend only to head back to a disorganized and chaotic office. But what if we could reclaim the Monday? What if we could hack the office to not only make Monday’s survivable but also enjoyable!? Well at StickerYou we’ve totally hacked our office with custom stickers and other sticky tricks to make the most of our Mondays (and the rest of our week). We’ve all seen those either flippable or tearable daily desk calendars. We either forget to flip or tear them, and when we do they create tons of waste (which in some offices can add to already overflowing recycling boxes). If this is your desk, you might want to opt for a writable adhesive desk calendar. Get a calendar that’ll last all year (and remove at the end of it), to circle and asterisk important dates or write and rewrite important memos. 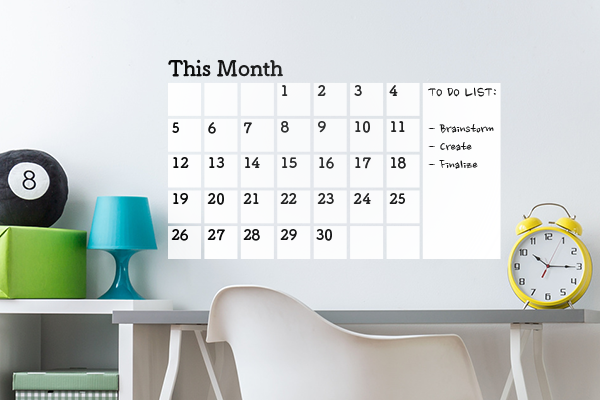 Our calendar stickers can also be made in larger sizes for walls to keep everyone in the office up to date, or get a dozen tiny monthly ones to create tabs for notebooks or folders. One of the more unpleasant feelings is to have to go super badly but all your washroom keys are gone. Worse yet, they’re constantly getting misplaced, lost, or mixed up! Fret not with bathroom vinyl wall graphics. Simply install a hook (or even a framing nail) on your wall and stick the appropriate signage above. 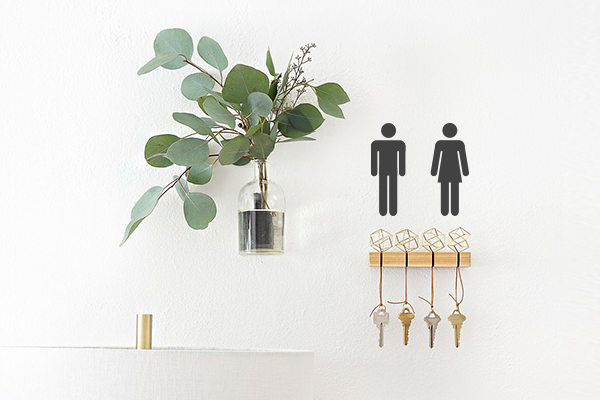 Get decals of individual bathroom logos, corresponding floors or simply the word “BATHROOM” for co-ed bathrooms to make sure everyone knows where to get - and drop off - their bathroom keys. White boards are great, but they can be expensive, heavy, and difficult to install. Giving employees individual meeting agendas can be a huge waste of resources. That’s why at StickerYou we’ve developed a hack that feeds our best interests and yours: dry erase wall decals. 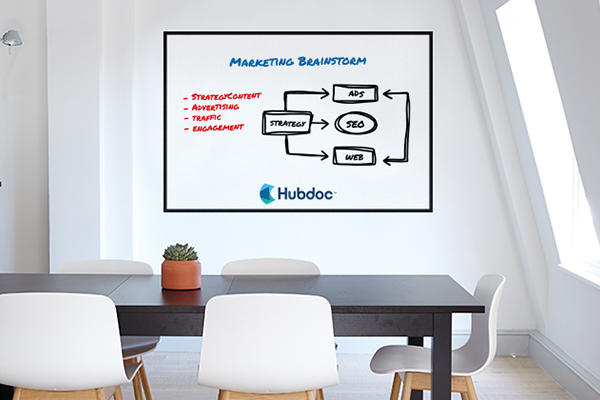 Our dry erase wall decals act like a whiteboard but adhere as a decal on our walls. You can make them as big as you need for open concept offices, or create smaller ones for each day of the week to micromanage each day. Dry erase walls can also be a huge power play to keep track of hockey pools, company wide contests, or charity goals. If your office uses a ton of desktop computers that probably means underneath your desk is an unending tangle of cords that all look the same and are impossible to figure out what they do, let alone what they’re plugged into. A quick and easy office hack is to get custom labels for each device you plug into your computer (printers, routers, latte warmers etc). 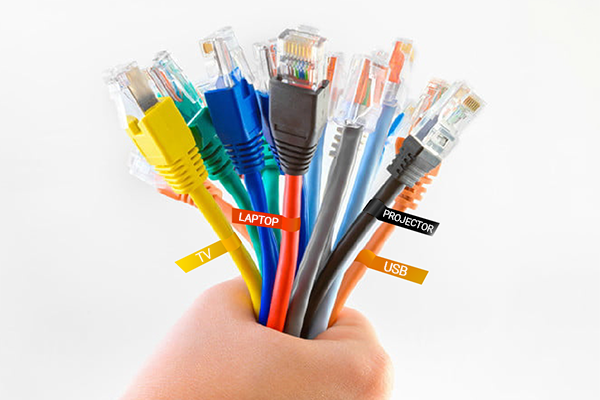 It may take a bit of untangling and replugging, but once all your cords are properly labelled with their corresponding device, you’ll never have to worry about knocking out, unplugging, or even losing an important cord connection again. Office buildings can sometimes feel like a labyrinth. Some visitors may not know how to navigate around your complicated office building, or if they do can get confused when every office door looks the same. 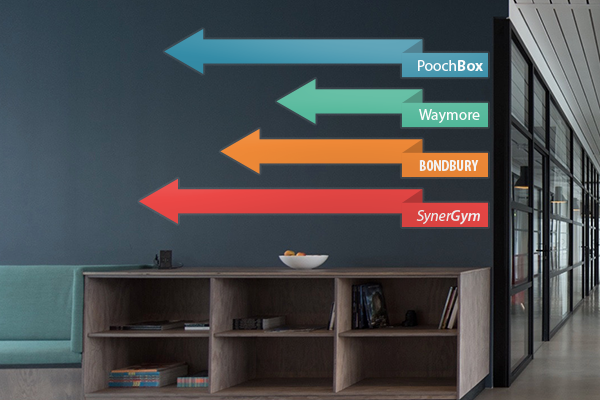 For a simple yet effective solution try using navigational wall and floor decals. Get a decal of your business’ logo and adhere them to either the wall or floor outside office. Wall decals can also be customized with the names of individual departments or the names of whomever works there. This is a great hack for open concept offices that have a lot of different teams (as it also easily directs people where to go) and their removability is ideal for ever changing layouts and spaces. Guaranteed to direct everyone in the right direction every time. Some workplace utilize laptop computers for different tasks depending on the department. But with multiple laptops being used by multiple employees and floating around an office, it can be difficult to remember whose is whose or to which department they belong too (especially if that department is low on laptops and needs them ASAP). 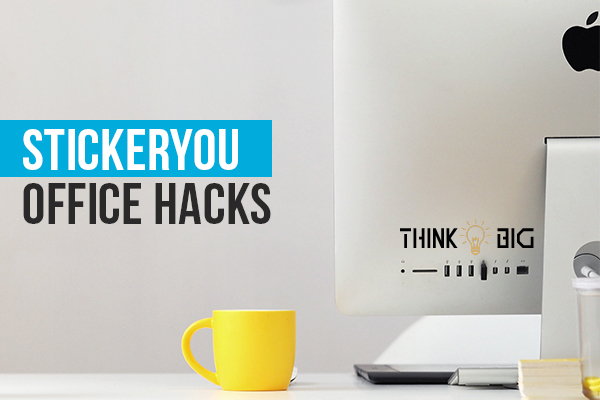 Luckily, StickerYou offers laptop stickers that can be applied and removed from laptops without damage! Easily create a sticker of your business logo and add the name of the department or office. You’ll always know which computer belongs where and won’t have to waste time booting each one up to make sure it has the programs you need to get your job done. Some production spaces and even offices have a lot of machinery that are all the same. A lot of open concept offices for example may have three different printers and photocopiers that are all exactly alike. This can obviously be confusing when trying to explain to a peer which paper shredder is acting up or which printer someone needs to pick up their documents from. 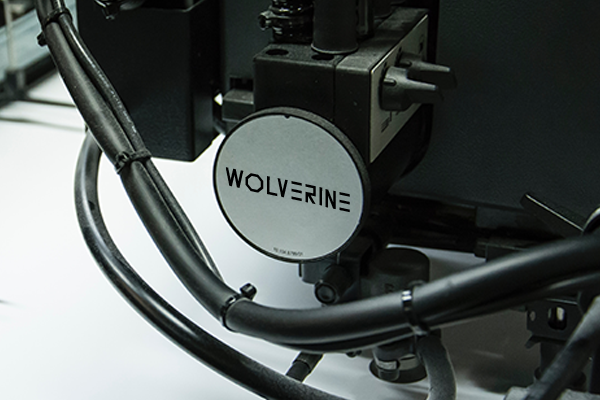 At StickerYou we have multiples of the same machine that print and cut stickers, to avoid confusion we came up with a stellar hack: we gave each machine a nickname to tell them apart (we have a machine that cuts we’ve appropriately named “Wolverine”). This also helps let others know if something went awry on a specific machine while someone was away. We’ve hacked our machines with permanent labels with the name and even the photo of the character we’ve named our machines after. If puns aren’t your workplaces vibe you can alternatively name and make labels of letters, numbers, or colours. Tired of checking the office dishwasher for clean cutlery only to find every utensil already covered in someone’s leftovers? Or, have you ever poured yourself what you thought was a fresh cup of joe only to find out it was made last week? Try our StickerYou tested and approved (we honestly use these in all our office kitchens) dishwasher status magnets! 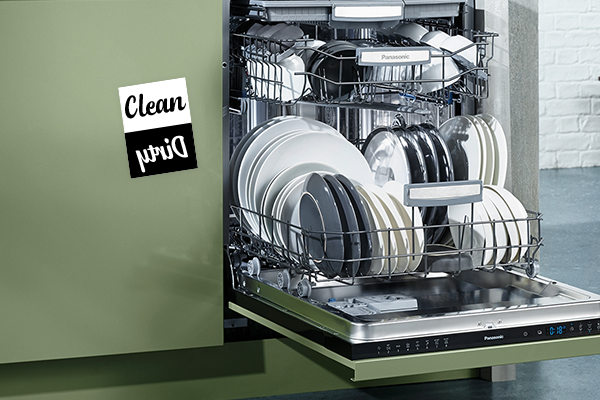 Mirror the words “CLEAN” and “DIRTY” on your magnet and turn it for when you’ve just done a cycle or desperately need to. Create a similar magnet with the words “FRESH” and “OLD” for coffee makers and carafes to make sure you’re getting a fresh jolt of caffeine every time. 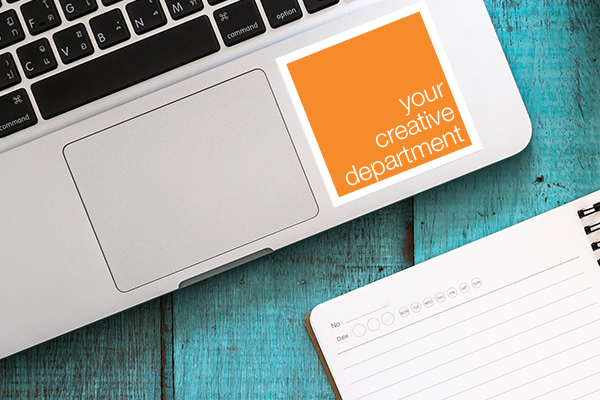 Alternatively if your office has magnetic doors or boards, you can customize your magnets with employees names to let others easily know if they’re in or out of the office. 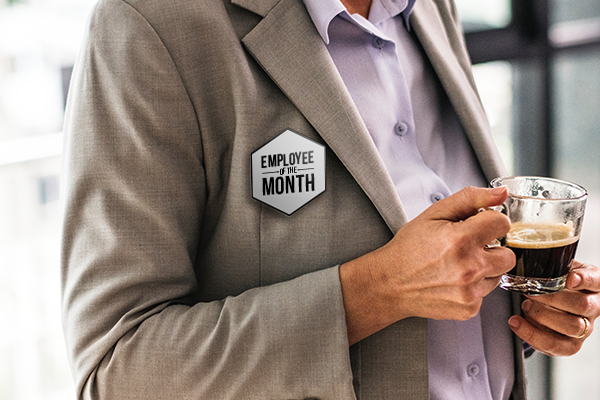 Have a monthly superstar employee? Or want a to start showing off the number of years some senior employees have been working with you? Name badges are a helpful way to not only let clients know who they’re interacting with, but also who other employees are working with. Modern name badges can be cut to exact shapes of logos or to house specific designs depending on employee’s department or job title. They’re also backed with magnets, not pins, so no one has to worry about damaging clothing or stabbing fingers. A super handy hack about styrene is that they’re totally writable and rewritable. Meaning all employees can write their own names in their own handwriting to further customize their badges, which also means you save on badges if said employees find other work. This hack is especially useful if you’re using temporary staff at trade shows or special events.